Bevette Menu Use the Bevette menu WordPress theme and launch an online food ordering system in your restaurant. See for yourself how it will help you earn more online. Take advantage of the Bevette WordPress menu theme Use the UpMenu WordPress plugin to launch your online food ordering system quickly and easily. Use the Yosoftware Bevette WordPress menu theme. It will only take a few minutes to integrate the menu template with your restaurant website. A classic, simple form The Bevette WordPress theme menu will allow you to embed your online food ordering system within your restaurant’s own stylish website. Easily choose colours and place the menu template on your restaurant website. For a fine-dining restaurant and a small bistro Whether you run a large, premium, high-end restaurant or a small bistro, the classic design of the Bevette WordPress theme menu will support your online sales. Use the WordPress menu template to make your restaurant website profitable. Make money from online sales The minimalist layout of the Bevette template will not only fit perfectly within your website, but will also ensure ease of navigation for your customers. 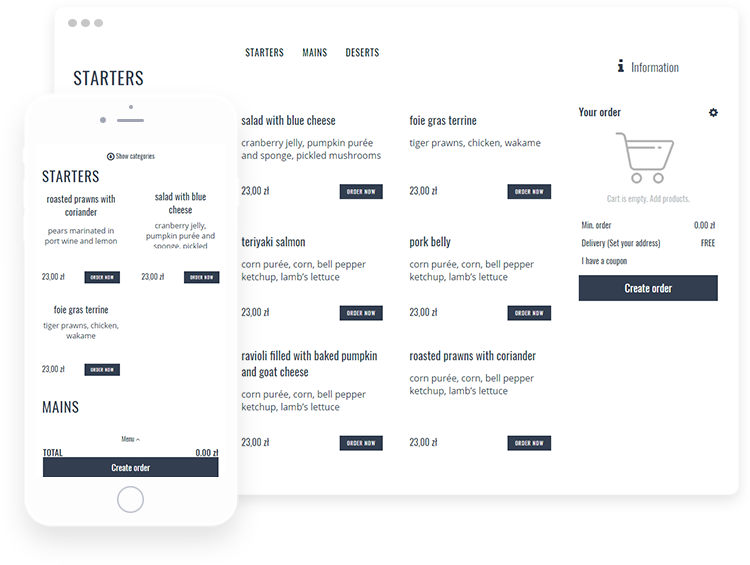 The three-column menu format will clearly present all the dishes on your menu and allow the customers to place an order in just a few steps.